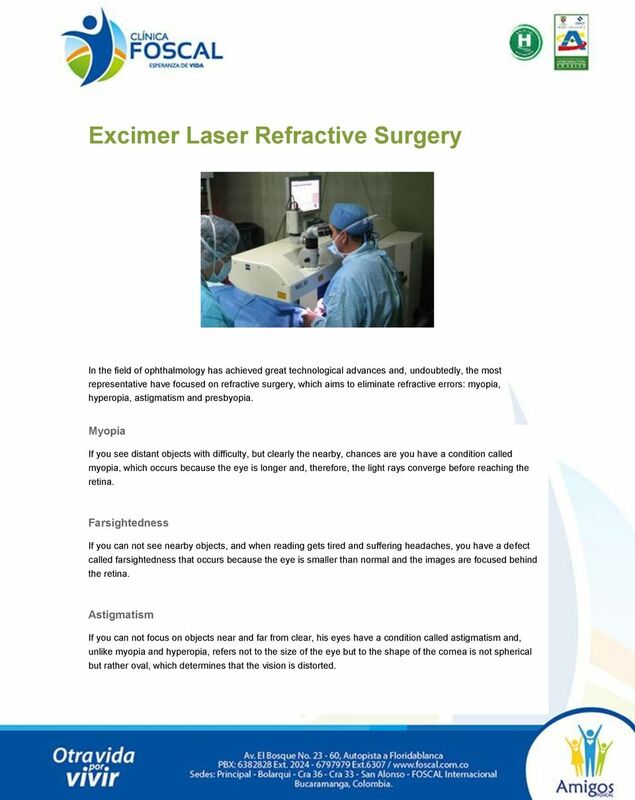 Download "Excimer Laser Refractive Surgery"
1 Excimer Laser Refractive Surgery In the field of ophthalmology has achieved great technological advances and, undoubtedly, the most representative have focused on refractive surgery, which aims to eliminate refractive errors: myopia, hyperopia, astigmatism and presbyopia. Myopia If you see distant objects with difficulty, but clearly the nearby, chances are you have a condition called myopia, which occurs because the eye is longer and, therefore, the light rays converge before reaching the retina. Farsightedness If you can not see nearby objects, and when reading gets tired and suffering headaches, you have a defect called farsightedness that occurs because the eye is smaller than normal and the images are focused behind the retina. Astigmatism If you can not focus on objects near and far from clear, his eyes have a condition called astigmatism and, unlike myopia and hyperopia, refers not to the size of the eye but to the shape of the cornea is not spherical but rather oval, which determines that the vision is distorted. 2 Presbyopia Such an optical condition is generated by the age, usually begins to appear between 40 and 45. Early symptoms are clear: difficulty reading or seeing close objects clearly and need more light than normal. Presbyopia affects both myopic, hyperopic and those who have never worn glasses or contact lenses. With refractive surgery you can improve your vision and personal image, forgetting the use of glasses or contact lenses and also any activity, including the practice of sports. 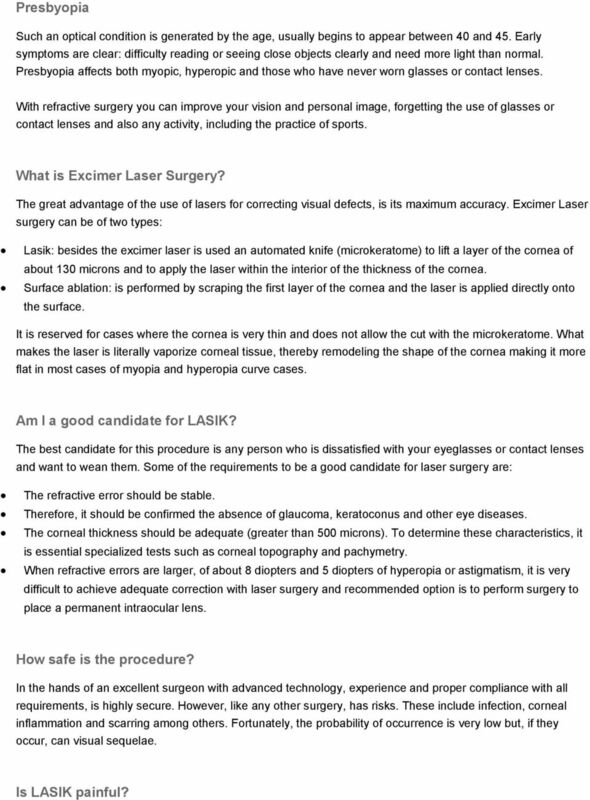 What is Excimer Laser Surgery? The great advantage of the use of lasers for correcting visual defects, is its maximum accuracy. Excimer Laser surgery can be of two types: Lasik: besides the excimer laser is used an automated knife (microkeratome) to lift a layer of the cornea of about 130 microns and to apply the laser within the interior of the thickness of the cornea. Surface ablation: is performed by scraping the first layer of the cornea and the laser is applied directly onto the surface. It is reserved for cases where the cornea is very thin and does not allow the cut with the microkeratome. What makes the laser is literally vaporize corneal tissue, thereby remodeling the shape of the cornea making it more flat in most cases of myopia and hyperopia curve cases. Am I a good candidate for LASIK? The best candidate for this procedure is any person who is dissatisfied with your eyeglasses or contact lenses and want to wean them. 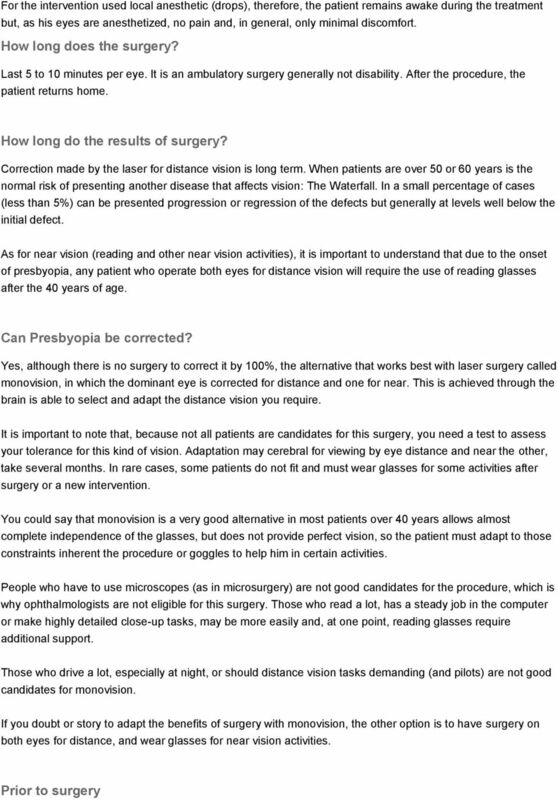 Some of the requirements to be a good candidate for laser surgery are: The refractive error should be stable. Therefore, it should be confirmed the absence of glaucoma, keratoconus and other eye diseases. The corneal thickness should be adequate (greater than 500 microns). To determine these characteristics, it is essential specialized tests such as corneal topography and pachymetry. When refractive errors are larger, of about 8 diopters and 5 diopters of hyperopia or astigmatism, it is very difficult to achieve adequate correction with laser surgery and recommended option is to perform surgery to place a permanent intraocular lens. How safe is the procedure? In the hands of an excellent surgeon with advanced technology, experience and proper compliance with all requirements, is highly secure. However, like any other surgery, has risks. These include infection, corneal inflammation and scarring among others. Fortunately, the probability of occurrence is very low but, if they occur, can visual sequelae. Is LASIK painful? 4 The first thing you should do is attend a specialized optometry and ophthalmology. It made detailed examinations that determine whether you are a good candidate for laser surgery and rule out any disease that may prevent action. If you are a good candidate, the ophthalmologist will give directions and recommendations should be considered before the procedure to ensure quality. Finally, your surgery is scheduled for the nearest date or day that you find most convenient. Note: If you wear soft contact lenses should discontinue their use before the examinations prior to surgery: one week if two weeks soft and rigid. Surgical Procedure The correction of nearsightedness, farsightedness and astigmatism is achieved by changing the shape of the cornea, flattening or slightly incurvándola. This sculpted corneal laser does the deep part of the cornea, after having raised a record corneal surface with the help of an automated instrument (Microquerátocono), this surgery is called LASIK. In some cases where the patient's cornea is too thin may require another procedure called "surface ablation". In these patients, visual recovery may be slower and require more medical tests. The surgery is performed only with anesthetic drops and is ambulatory. Basic Care The patient may notice some additional fatigue or difficulty focusing, sometimes dizziness. All this is normal during the initial period. 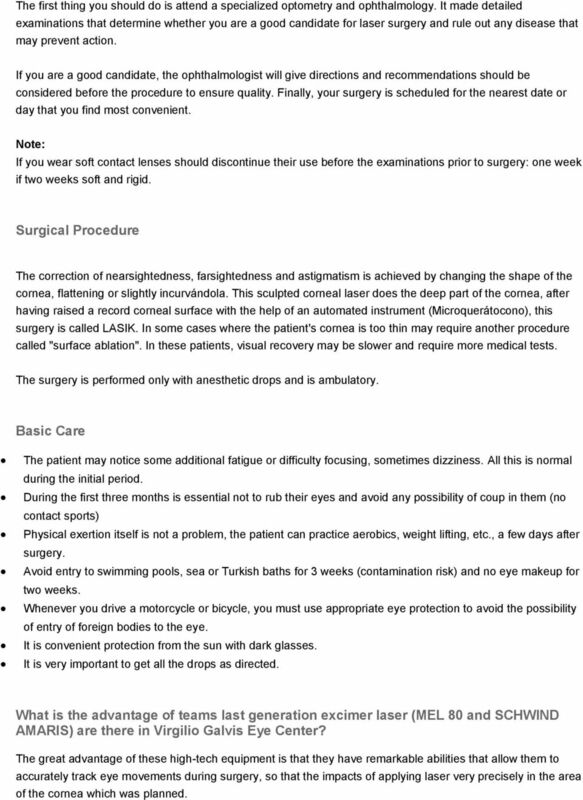 During the first three months is essential not to rub their eyes and avoid any possibility of coup in them (no contact sports) Physical exertion itself is not a problem, the patient can practice aerobics, weight lifting, etc., a few days after surgery. Avoid entry to swimming pools, sea or Turkish baths for 3 weeks (contamination risk) and no eye makeup for two weeks. Whenever you drive a motorcycle or bicycle, you must use appropriate eye protection to avoid the possibility of entry of foreign bodies to the eye. It is convenient protection from the sun with dark glasses. It is very important to get all the drops as directed. What is the advantage of teams last generation excimer laser (MEL 80 and SCHWIND AMARIS) are there in Virgilio Galvis Eye Center? The great advantage of these high-tech equipment is that they have remarkable abilities that allow them to accurately track eye movements during surgery, so that the impacts of applying laser very precisely in the area of the cornea which was planned. 5 Additionally, the profile of each laser shot is applied at a rate of 250 times per second (MEL 80) and 500 times per second (AMARIS SCHWIND), the surface of the cornea does not suffer from overheating during application of the laser and is an excellent regularity, ensuring visual quality. To date, several million patients have been treated worldwide. So why not discover the benefits The Eye Hospital can bring to your life. Copyright 2013 Eyemax. All rights reserved. The Laser Eye Center s surgeons are sub-specialized in both cornea and refractive surgery, and are among the region s most experienced surgeons. THE GUIDE TO REFRACTIVE LENS EXCHANGE SEE CLEARLY.